Stonecarving City is the first level of the Ratl Ruins area in the game Wario Land: Shake It! The stage is set in an ancient city, filled with all sorts of stones that have been carved into various shapes and designs. 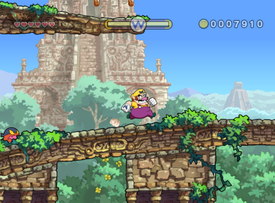 While this suggests that an ancient civilization once lived here, the only inhabitants at the time Wario explores the city are common enemies (mainly Bandineros) found throughout many stages of the game. As it is the first main level in the game (there is a training level before it), it is relatively simplistic in design, with the level's three treasures in locations which are quite easily reached, usually by manipulating nearby objects. When Wario eventually finds the caged Merfle, upon rescuing it the rush to the exit (same location as the start) poses very few obstacles for Wario to evade, due to the level being a post-training introduction to the general gameplay. Ayayan iseki From "Mayan" Civilization. Arrangements of this level's music were used for Wario's victory theme and part of the "Waluigi Pinball" arrangement in Super Smash Bros. Brawl, Super Smash Bros. for Nintendo 3DS / Wii U, and Super Smash Bros. Ultimate. The level's music can also be selected to play on the Gamer stage in Super Smash Bros. for Wii U, as well as on any custom stages the player creates, and on the WarioWare, Inc. and Gamer stages in Super Smash Bros. Ultimate. This page was last edited on January 14, 2019, at 21:32.